On 13 July, the Libraries Taskforce meeting was hosted in the conference suite at Cambridge Central Library, the fourth busiest public library in England, located within the Grand Arcade and Lion Yard shopping centres in the centre of the city. 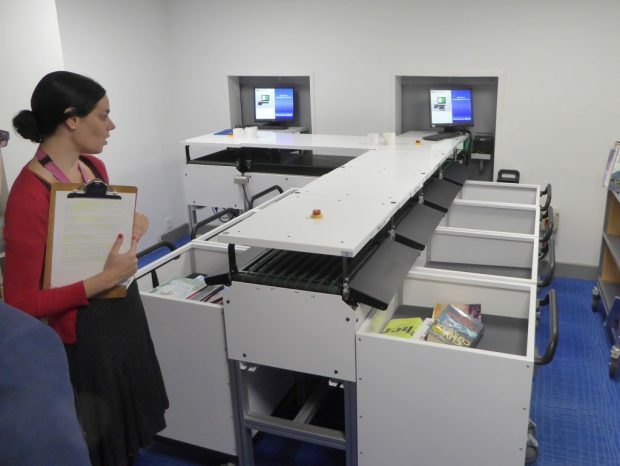 The pre-meeting tour featured the newly refurbished children’s library, the book sortation system (one of the largest in the country), and the BFI Mediatheque (digital archive film and TV footage). The meeting provided an opportunity to present an overview of Cambridgeshire Library Service and our Arts Alive! programme, and to discuss the service’s transformation journey and developing future strategy, using Libraries Deliver: Ambition as a framework. its excellent and growing network of 32 library buildings, with 17 libraries rebuilt or improved between 1990 and 2010, and 7 new libraries opening over the next 5 years (these are new buildings in response to housing growth in the county, not replacements of existing buildings, and most of the capital funding comes from external sources). During the meeting, Community Participation Manager, James Nicol, gave a presentation about Arts Alive! 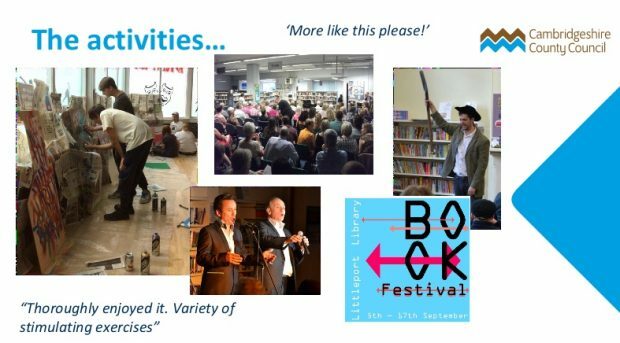 Cambridgeshire Libraries’ highly successful Arts Council funded programme of arts activities staged in libraries across the county. Using library spaces flexibly provides the opportunity to inspire creativity and learning experiences, which we have put into good effect with this programme that has featured music, arts and crafts, creative writing, book festivals, author visits, film shows, and more. Not only has this brought high quality arts activities into areas of the county with low cultural engagement, but it has built the skills of local people – in particular library Friends Groups – to put on events (including fundraising, budgeting, sourcing, booking, marketing and running the event), and demonstrated the potential of the library as a flexible community resource. We are very proud that this success has been recognised and built upon by becoming one of the Arts Council’s first library National Portfolio Organisations, awarded nearly £700,000 to deliver arts in libraries over the next 4 years. The council will be using Libraries Deliver as a framework for the next stage of the transformation journey, with a focus on developing the use of the service as a corporate asset and for the delivery of commissioned services, as well as greater commercialisation and regional partnership working. This refreshed strategy will provide a clear statement of the function and role of the service for Cambridgeshire and how we will deliver future savings while meeting our statutory requirement. As previously mentioned, the Taskforce has decided to focus each meeting on one or more of the 7 Outcomes. The sixth of these sessions, led by the Arts Council’s Brian Ashley, focussed on Outcome 1. Brian bringing us up to date on current work being undertaken by the Arts Council to support the role of libraries as places to go to experience culture and to co-create. Neil MacInnes presented the Society of Chief Librarian’s work to develop a new Culture Universal Offer, which is due to be launched in the autumn. James Nicol - Development Manager: Adults, Service Development Team (Libraries), Cambridgeshire County Council, presented Cambridgeshire’s work in developing cultural programming across their network in partnership with local communities. Jane Ellison - Director of Creative Partnerships, BBC, told us about the BBC’s Civilisations Festival, to be held between 2-11 March 2018, and the potential for libraries to play a significant role in delivering it into communities. Ed Humphrey - Director of Digital and Enterprise at the British Film Institute, spoke about the BFI’s work to help people explore their local identity more deeply through BFI’s heritage collection of TV and film, and BFI’s vision of how libraries were a natural partner in getting this cultural content out into communities. An interesting project mentioned in his presentation was a partnership with cinegi, currently subject of an ACE-funded pilot, which was aiming to get more cultural content out into community spaces by making films available for screening easily and straightforwardly through digital channels. A wide-ranging discussion followed, which was mirrored by a series of online discussions as Taskforce members raised the question on twitter. One exchange ran: “to what extent does the library profession regard arts and cultural participation a key part of being a library? Replies include Liverpool libraries: “Always hosted exhibitions, lectures and events; nothing new, intrinsic for developing new audiences-placebuilding in support of the community”, and others “Don’t want to limp in with the arts as libraries fundamental to all disciplines”, “more important question is what is libs primary purpose and how does arts and culture relate to that”, and the blunt “its all gravy, can’t have gravy without the dinner to put it on”. To which Nick Poole replied: “Point was made here that arts animate libraries and help users discover them/see them as relevant - makes the case for dinner”. The Taskforce agreed that there were clear leaders of activities which contribute to this Outcome, including Arts Council England who focus their efforts on supporting the cultural role of libraries through advocacy, development and investment. We noted that the Arts Council would also be looking to develop library services’ ability to access funding to develop cultural programmes, by running workshops over the autumn to enhance their skills in bidding for Arts Council grants. We agreed that the Taskforce and its members would promote and support the SCL’s Culture Offer once it was in place, but it noted that no further input was required from us at this stage. To summarise, we recognised the need for the library sector to develop clear contact paths for partners interested in working with them to deliver cultural opportunities, and the agility to respond rapidly to these approaches. There needs to be a clear articulation for individual library services of what opportunities could currently be available and routes to exploit these according to local interests and needs. Finally, the development of the skills and knowledge to establish library staff as confident cultural programmers continues to be a priority. Full minutes of the meeting have been published on GOV.UK. Our next meeting will be on 4 October in Canning Town Library, Newham. It will include presentations and a discussion on Outcome 7: Stronger, more resilient communities.